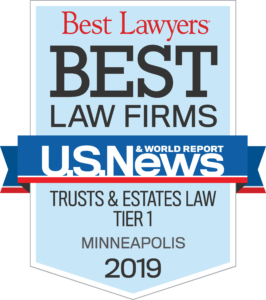 U.S. News and World Report has named the Yanowitz Law Firm as a Tier 1 Best Law Firm in the area of Trust and Estates for 2019! This is the second year in row we have received this recognition. Only 10 law firms in Minnesota received a Tier 1 Best Law Firms Minneapolis regional designation for Trust and Estates. In 2019 we were the only law firm in Minnesota south of the Twin Cities to receive this award. The honor results from a rigorous evaluation. Lawyers, clients and professionals evaluated our expertise, responsiveness, cost effectiveness and their likelihood to recommend our firm. Law firms are evaluated in Minneapolis, St. Paul, Rochester, Duluth, Mankato, Winona, and St. Cloud. Every year since 1995, Alan Yanowitz has received recognition as a Best Lawyer by Best Lawyers in America. Every year since 2003, he has also been listed as a Super Lawyer by Thompson Reuters. At the Yanowitz Law Firm we help families get their affairs in order. We are there when a loved one passes away. We craft practical and enduring wills and trusts.